Need an emergency electrician for electric fires? Call Briggs today! In the event of an emergency, call Triple Zero (000) immediately. Fires are unfortunately the cause of thousands of deaths around the world every year. According to the Australian Bureau of Statistics, 123 people died from accidental fire or flame injuries in 1998. Of these 123 deaths, 70 occurred in a house fire. According to CFA Victoria, there are an average of 3000 house fires in Victoria every year. Many are caused by electrical faults, which can result from a number of electrical problems. 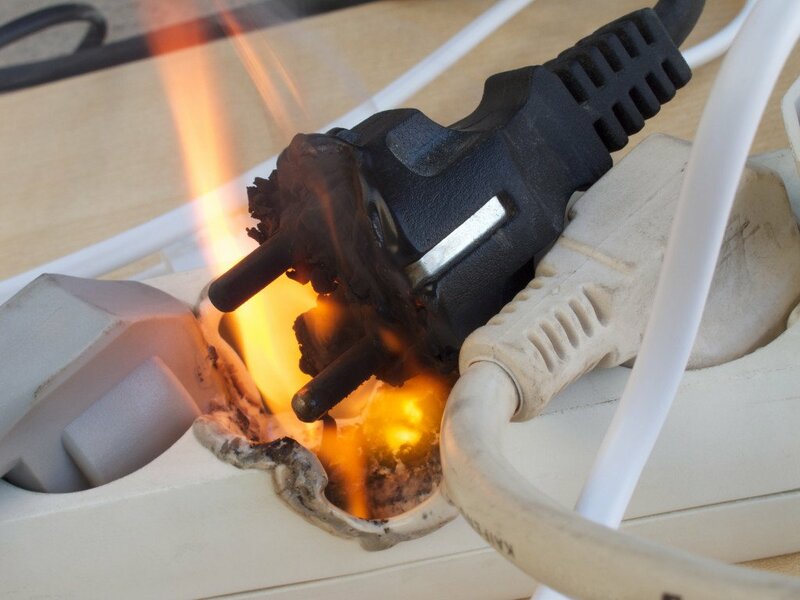 Most electrical fires result from problems with wiring, extension cords and faulty plugs. Keep an eye on your plugs and immediately get any damaged, worn, or faulty ones replaced by a qualified 24 hour electrician in Melbourne. Old wiring is a common cause of electrical fires. Older wires are protected by a rubber coating, but over time, this protection can deteriorate, leaving exposed wires and as such increasing the risk of an electrical fire. If your home was build before the 1980s, now is the time to organise an electrical inspection. Today’s wires are coated in PVC, which is much more durable. Circuit overload can also lead to electrical fire. Each time we buy a new appliance, like a dishwasher, television, or refrigerator, we are adding an additional consumer to our electrical circuit. Many times, a newer appliance will replace an older one, but in instances where appliances are added to a circuit, it can generate an over-consumption that can lead to a fire hazard. You may consider separate electrical circuits in the home, designed to lessen the burden on a single circuit. Split circuits are also common in high-powered buildings like offices or other commercial settings. Household appliances that are overused or misused, or otherwise faulty, can also cause electrical fires. The scary part is that a lot of the time, you mightn’t know if an appliance is faulty, and will continue to use it as usual. Contact Briggs immediately if you are having problems with household appliances and are concerned about your electrical system. Call now!